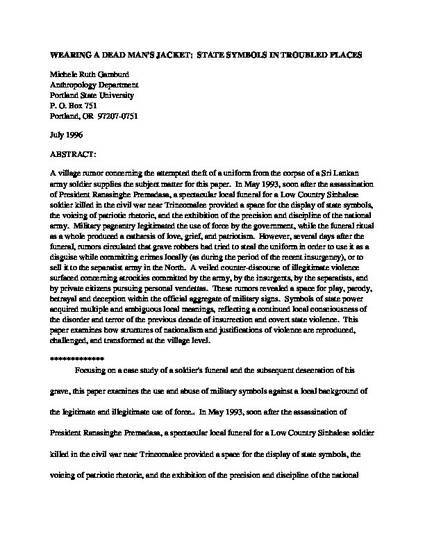 A village rumor concerning the attempted theft of a uniform from the corpse of a Sri Lankan army soldier supplies the subject matter for this paper. In May 1993, soon after the assassination of President Ranasinghe Premadasa, a spectacular local funeral for a Low Country Sinhalese soldier killed in the civil war near Trincomalee provided a space for the display of state symbols, the voicing of patriotic rhetoric, and the exhibition of the precision and discipline of the national army. Military pageantry legitimated the use of force by the government, while the funeral ritual as a whole produced a catharsis of love, grief, and patriotism. However, several days after the funeral, rumors circulated that grave robbers had tried to steal the uniform in order to use it as a disguise while committing crimes locally (as during the period of the recent insurgency), or to sell it to the separatist army in the North. A veiled counter-discourse of illegitimate violence surfaced concerning atrocities committed by the army, by the insurgents, by the separatists, and by private citizens pursuing personal vendettas. These rumors revealed a space for play, parody, betrayal and deception within the official aggregate of military signs. Symbols of state power acquired multiple and ambiguous local meanings, reflecting a continued local consciousness of the disorder and terror of the previous decade of insurrection and covert state violence. This paper examines how structures of nationalism and justifications of violence are reproduced, challenged, and transformed at the village level.